Control who and what enters your Hickory pool with high-quality swimming pool covers. 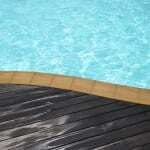 Swimming Pool Covers in Hickory – Swimming pool covers offer protection for one you most beloved investments. In addition to keeping your in-ground pool safe from damage, a swimming pool cover will help keep every member of your family safe from harm. Control who and what enters your Hickory, North Carolina pool with a high-quality swimming pool cover from S & H Pools. Our many options are perfect for preserving your favorite summer space. There are many types of swimming pool covers to choose from, each with a unique purpose to take advantage of. Solar – Solar swimming pool covers come in the iconic blue color. These are the most widely found because they are cost-efficient and easy to use. Solar swimming pool covers are able to capture heat from the sun, keeping your pool’s temperature several degrees above what it might be without the cover. Solar covers offer little protection from the elements, but they can keep the water warm and prevent it from evaporating. Winter – Winter pool covers are a great choice for preserving your pool during the winter season. While floating covers do not keep kids and animals safe from the pool, these covers are efficient at keeping the winter elements out. Safety – Safety covers are made from strong, durable materials. They can carry thousands of pounds of pressure, ensuring your family, friends, customers, and pets are safe from accidental contact with your pool. Leaf Net – A leaf net is a very basic mesh cover, but it will help you save on time and hassle of continually keeping leaves out of your pool. 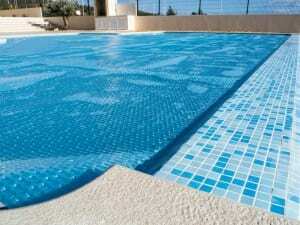 We are happy to help you choose the right swimming pool cover option for your needs. Trust our team to provide you with exactly what you need for you residential or commercial outdoor pool. Contact us today to learn more!